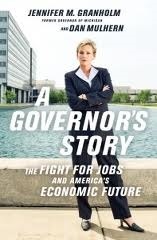 Jennifer Granholm, the Governor of Michigan during the Great Recession, expresses eternal optimism in this book. Of course, anyone serving as Governor of Michigan during the Great Recession better express eternal optimism, or they'd go crazy. Granholm frames the book with a opening chart "7 months of free fall" (events of the Great Recession) and a closing chart of "11 months of hope" (her policy responses to the Great Recession). The key events of the "7 months of free fall" were the bankruptcies of Chrysler and GM, the largest bankruptcies in US history, and Granholm's constituents took the brunt of the unemployment hit from those massive restructurings. But Granholm goes overboard on the optimism--portraying her critics and opponents as all just pessimists and naysayers. That sort of one-sided optimism is why unauthorized biographies are superior to autobiographies--because a journalist author has the opportunity to present both sides, rather than a politically-motivated one-sidedness like Granholm's book. This autobiography only shows the GOOD news--that "11 months of hope" chart implies that everything will be OK once her policies take full effect. But that did not prove to be the case--she left office in January 2011, and the city of Detroit declared bankruptcy in July 2013, only 18 months later, with her policies still mostly in force. A more realistic assessment would have felt less like brainwashing. Jennifer Granholm is considered a Rising Star in the Democratic Party. Her one shortcoming is that she was born in Canada, and hence is ineligible for the presidency or vice presidency. If not for that inconvenient Constitutional restriction, Granholm would be on every pundit's "short list." In fact, Granholm makes some pundits' "short list" anyway--in conjunction with Arnold Schwarzenegger, who was considered a Rising Star in the Republican Party with the same inconvenient Constitutional restriction of having been born abroad. The pundits' idea is that a Constitutional amendment would change that restriction, and it would pass quickly with bipartisan support because of the bipartisan appeal of the Schwarzenegger-Granholm pairing. It will be left to be seen if Schwarzenegger can recuperate from his recent scandals to reignite that debate by 2016 or even by 2020. Jennifer Granholm: Lower tax rates mean budget cuts, then more cuts. Barack Obama: Irresponsibility on Wall Street led to financial crisis. Chris Christie: OpEd: Don't pick winners & losers? Picks "critical" sectors. George W. Bush: 2006: Automakers need a product that's relevant. Jennifer Granholm: Executive pay imbalance is improper from moral standpoint. Jennifer Granholm: Tax cuts are minor compared to talent recruitment. Jennifer Granholm: We pick winners & losers to compete against other states. Jennifer Granholm: Carmaker government-run bankruptcies saved GM & Chrysler. John Kasich: OpEd: Don't pick winners & losers? Offers 12 tax credits. John Rockefeller: Persuaded Toyota to build plant in West Virginia. Mark Sanford: 2009: Disdainful of auto companies' bailout proposals. Mike Johanns: Auto bailouts were worst investment you could possibly make. Mitch Daniels: OpEd: proclaims laissez-faire; but offers 8 tax credits. Mitt Romney: NY Times editorial: "Let Detroit Go Bankrupt". Rick Perry: OpEd: Says don't pick winners & losers; but doles out $250M. Tim Pawlenty: 2009: Automakers should have gone bankrupt 6 months earlier. Barack Obama: Race to the Top: 46 states competed for creative reform. Jennifer Granholm: 2002: Invest in early education through college scholarships. Jennifer Granholm: Every child in Michigan takes a college-prep curriculum. Jennifer Granholm: Diversify into renewable and clean energy. Jennifer Granholm: Irresistible tax credits for wind, solar, & biofuels. John Dingell: Led fight against federal fuel economy standards. Jennifer Granholm: NAFTA is about whether we're going to make things in America. Jennifer Granholm: Replace CAFTA outsourcing with "No Worker Left Behind". Jennifer Granholm: Encourage insourcing, instead of victims of globalization. Joe Biden: I'm a "car guy"; I recognize importance of manufacturing. Barack Obama: 2008: must be national system; not state-level pilots. Jennifer Granholm: $50M bailout of Detroit Medical Center during recession. Jennifer Granholm: Jobs Race to the Top: compete for regional job creation. Carolyn Kilpatrick: Son Kwame resigned as Detroit mayor in criminal scandal. Jennifer Granholm: Born in Canada; raised in California; elected in Michigan. Jennifer Granholm: Elected Attorney General on slogan, "I'll take your case!". Jennifer Granholm: 2003: GOP tax policy based on unimaginably rosy assumptions. Jennifer Granholm: Lower taxes DID create jobs, but not necessarily in America. Jennifer Granholm: We have failed to invest in our physical infrastructure.